Wine lovers of Falconbridge get together every other month to sample wines and socialize. A different resident hosts each party and selects a theme for the wine selection: sometimes a varietal, sometimes a region, sometimes a surprise. The emphasis is on learning about wines and enjoying the good company. Previous wine expertise is certainly not required. 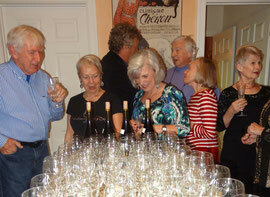 For more information about joining the Wine Tasting Group, send an email to Ron Hutchinson at roseron61@gmail.com. Open to all members of the Falconbridge Alliance.